Home generators are permanently installed, and provide your home with automatic backup power during a power outage. Bundled with an automatic transfer switch, your home standby generator runs off of natural gas or liquid propane. 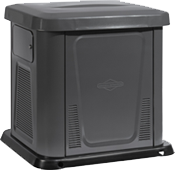 Turn on the performance with Briggs & Stratton 12kW1 home generator system. Its streamlined design meets the power needs of your whole house, with a more compact, affordable unit. The 12kW1 is ideal for medium-sized houses. 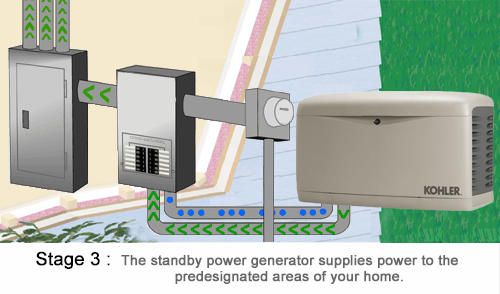 Protect your home and family from power outages with Briggs & Stratton 16kW1 standby generator systems. Perfect for medium-sized homes, Briggs & Stratton provides reliable power and flexible options to meet your home’s essential power needs. This backup generator comes with the best value warranty. Nobody else offers a 4-year limited warranty that includes both parts and labor! Briggs & Stratton 20kW1 standby generators provide backup electricity for your air conditioner, appliances, lights, TVs or computers and give you the peace of mind to take charge. 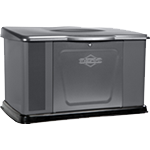 Ideal for large-sized homes, Briggs & Stratton standby generators can dependably power your home’s essential power needs with flexible power options. This backup generator comes with the best value warranty. Nobody else offers a 4-year limited warranty that includes both parts and labor! Runs on either natural gas or liquid propane (LPG) with simple switching between natural gas and LPG in the field. Streamlined installation, including built-in base that eliminates need for concrete mounting pad and simple terminal block for easy field connections. PowerBoost™ technology provides power to start large loads such as central air conditioners without dropping power to other appliances. Runs on either natural gas or liquid propane (LPG) with simple switching between natural gas and LPG in the field. Streamlined installation, including built-in base that eliminates need for concrete mounting pad and simple terminal block for easy field connections.